At this time of year, my mind starts to fixate on seeds for the upcoming garden. Not that I can do anything about it; it is way too early for me to get any seedlings started indoors. I do, however, check my seed starting schedule to see when I can get those first seeds started. Sometimes I will feed my urge and start some perennial flowers and that helps a bit. But really it is veggie seeds I want to start planting. I am always itching to get some salad greens going. 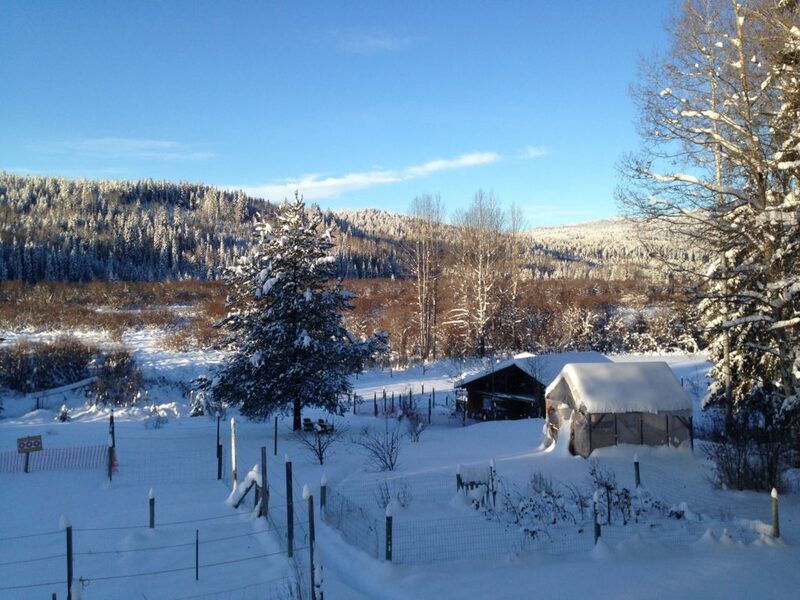 But it’s definitely still winter here in the Cariboo. We usually have several feet of snow – the garden soil (and all our Fall planted naturally grown Canadian Garlic) is resting for a while longer. That snow acts as a great insulator. A really important factor in when you should be starting your seedlings is your elevation. Most people do not take into consideration the importance of the elevation you are gardening at. Higher elevations can mean later harvest dates and the possibility of earlier frosts. We’re at 2800 feet elevation here and often can’t even get into the garden until the early weeks of May. In drier years, we might be able to get root crops planted in late April. 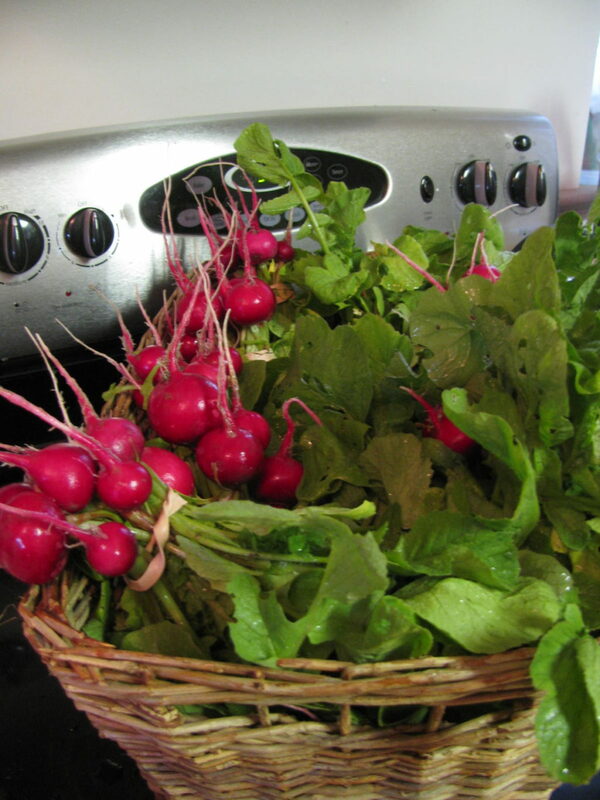 Root crops include vegetables like potatoes, beets, carrots, turnips…the list goes on. These root crops can go in the garden just as soon as you can work the soil. It doesn’t matter if the weather turns cold after they are planted, they will be fine. If you’re not sure of your elevation, you won’t really know how long your growing season is. You need to know the length of your growing season. Talk to gardening neighbors and ask for gardening tips. You can learn a lot about local weather conditions and the micro climates in your garden. If you are new to gardening in the North, you may not know how difficult it can be to grown certain kinds of vegetables. I had no idea before we moved here that it is VERY hard for us to grow corn outside of the greenhouse. Some veggies are definitely more heat loving than others. Getting these heat lovers (peppers, tomatoes, squash) started too soon can mean leggy plants or even flower buds forming in the house. Colder winter climates mean later starts in the garden and you have to adjust accordingly. Don’t forget to take cool nights into consideration. If you have extreme temperature swings (night and day) take extra precautions if you need to. Remay cloth or a small hoop house may be a great help in protecting those heat loving vegetables. 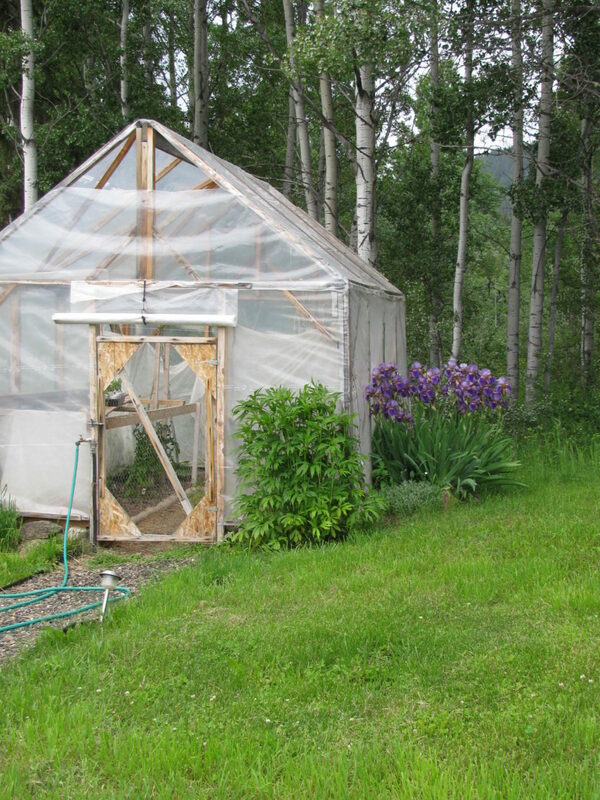 If you are thinking of something larger, read about how to build a greenhouse for under $200.00 like we did. The flip side of living here is that vegetables seem to grow a lot faster here than they did down on the BC Coast. Even though we start later than a lot of other gardeners, most of our late maturing vegetables can still be harvested before the end of September. 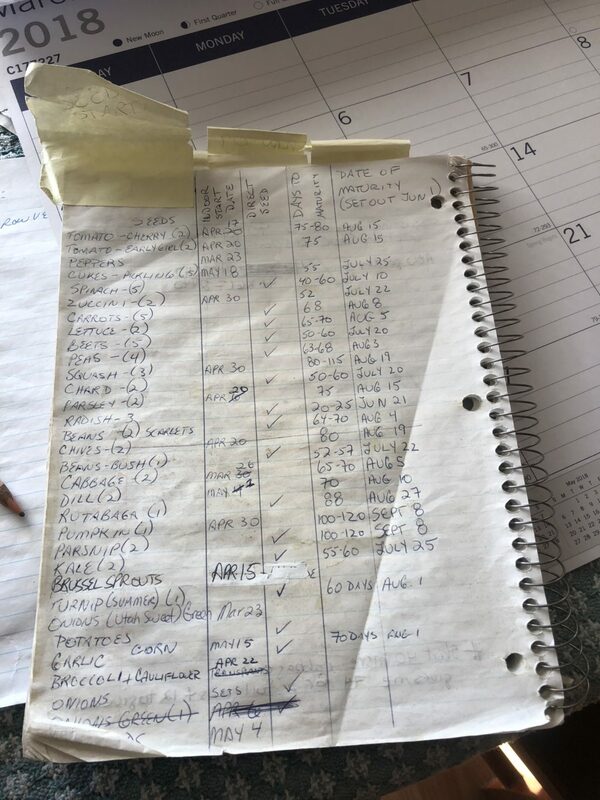 Not long after we moved here in 2006, I sat down with all my seed packages and figured out a seed starting schedule. This is specific for my area (Zone 3 Canada) and I use a transplant date of June 1 (the date by which I can actually move the seedlings into my Garden). Plants like peppers and tomatoes can go into the greenhouse usually by the end of the first week of June. Overnight temperatures here can be a killer, even when plants are under cover! When I wrote this up, I couldn’t find a plant chart anywhere with my Garden Zone. 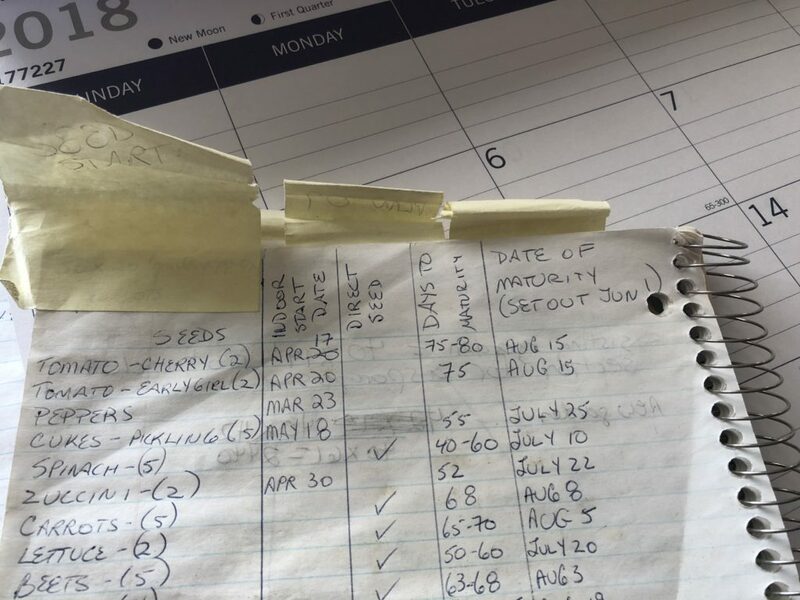 Use my seed starting schedule and make it your own. Vary the dates according to your gardening zone. Remember to check your elevation and change the dates accordingly. If you are at a higher elevation, you may need to stretch the dates out another week. 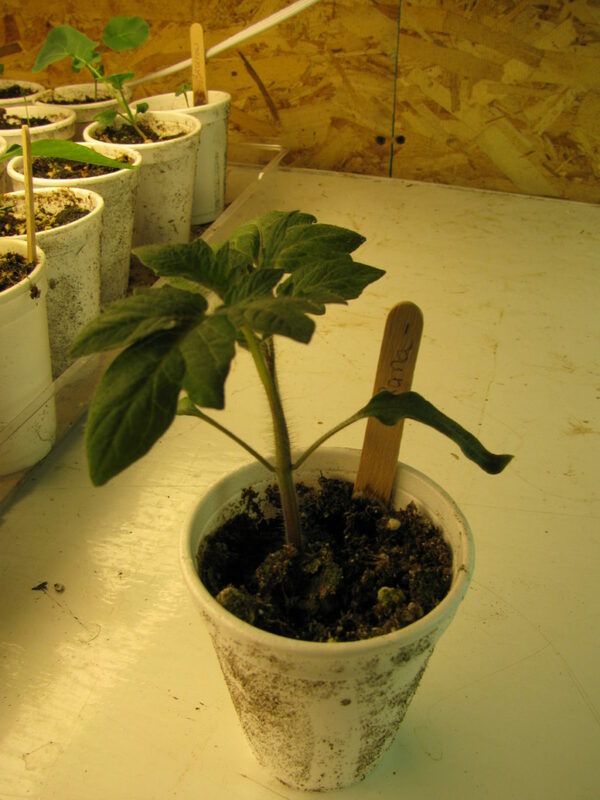 I’ve got the Indoor Start Date, the Days to Maturity and the Dates of Maturity, using the June 1 transplanting date. I also have a column named Direct Seed. This is for vegetables that I can just direct seed right into the garden and don’t need to bother starting in the house. You may think that is an unnecessary column, but it helps me when it comes to seed ordering time. I can look at the vegetables that fall into that category, check them against my supply on hand and figure out easily if I need to buy more seed. See the numbers in parentheses after the Vegetable type? Those were the number of seed packages that I had on hand the year I made up the list, so just ignore them. As you can see by looking down the Indoor Start Date, the earliest date to start anything is March 26! I will start with seeding Cabbages and Peppers and won’t even move on to seeding any Tomatoes until mid-April! This seed starting schedule helps me keep on track and not plant too early (or too late). These dates may seem very late to you, but this is what works here for us at 2850 feet elevation and a Zone 3 garden. If you live in the Cariboo (or northern US), don’t start your seeds too early. It is an easy mistake to make! 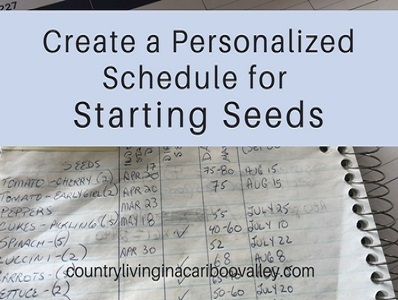 Make a specific seed starting schedule for your own garden and then follow it. It is heartbreaking to end up with very leggy vegetable seedings. They tend to break very easily when you have to move them from the house out to the garden. You can transplant them into larger containers if you need to. Most plants like growing root bound and then being transplanted into extra room to put on more growth. 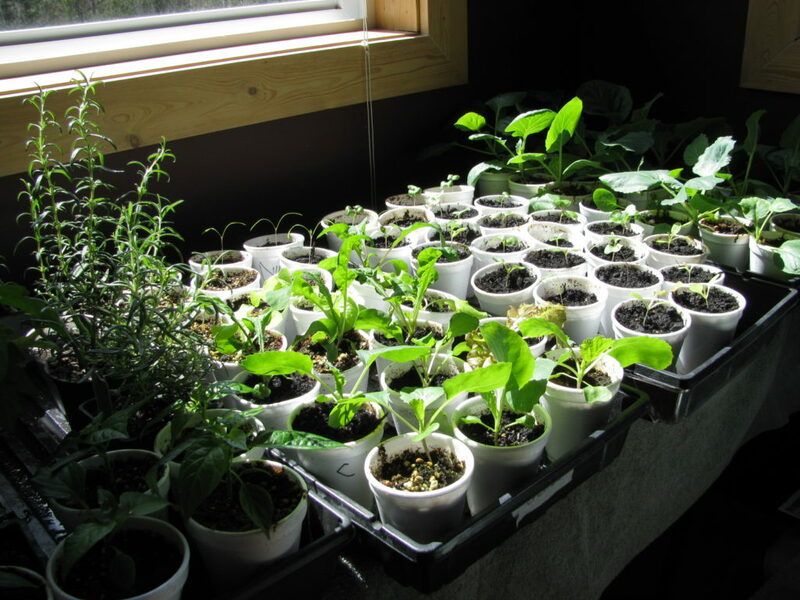 We usually start so many seeds indoors I simply don’t have room to keep that many big pots in the house. Tomatoes are always transplanted, at least once but sometimes twice. They really benefit from being moved up into a larger pot. I try to start in small containers and then transplant them as they grow. It is more work for me, but the plants respond better by getting root bound first and then transplanted. Here’s how to transplant tomatoes. 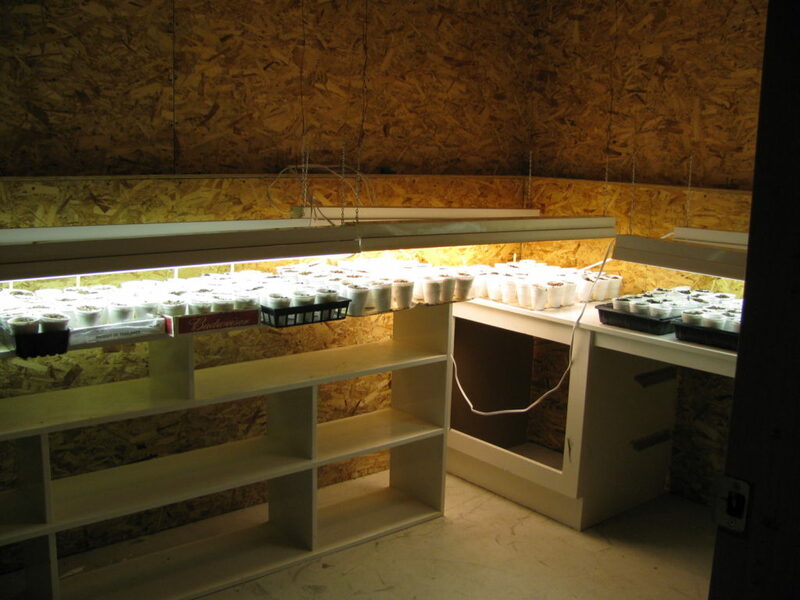 I start a lot of my seeds under lights down in our basement and then move them up to my living room when they get large enough to not need the lights. This helps make room for even more seedlings downstairs. If the weather is warm enough, I then move them out to the greenhouse, where I can also start other seeds. Our greenhouse is unheated and so it depends on how cool the nights are, as to whether I can move and start seedlings out there. I’m going to start a few seeds for a few plants tomorrow but only because I want something green to take to a talk I’m giving at a garden show. I won’t start anything to go into the high tunnels for a few more weeks, and nothing for outside until April 1. Your seed starting is MUCH more organized than mine. Great photos! Hi Robin, it’s so nice to hear from others in the colder climates. It makes me feel less alone 🙂 in my gardening schedule. I have got to get into high tunnels here, this may be the year to start with that. I hope you are going to write about your garden talk over on your site as I would love to hear how it all went. Hi Patty, nice to hear from you again. I’ll bookmark your site again, as I lost it somehow last time. It sounds like we have pretty close to the same gardening season. I’m glad you’ll get use from my chart. Our problem is same as yours, the cold nightime temps. I do make use of row covers over the greenhouse seedlings, but sometimes that may not be enough extra protection. Off to check out you site! Your garden is always so beautiful no matter when you plant!! I just started the Summer garden…the Winter garden is about ready to harvest and there won’t be a Spring garden…I think we won’t have a Spring this year…just Summer. Hi Lynda, I wish I could have more of an all season garden, like we did on the Coast. Why are you thinking you won’t have a Spring? Have you moved into the hot weather of Summer already? Your garden chart is great – and well used I might add! Wow! Looks like you have a great start! My list helps me to stay on track, both with planting times and also with what to plant.